The five-year Fighter Verses™ Bible memory program features 260 essential verses to arm believers to faith for faith and love, and against unbelief and sin. You are encouraged to memorize one verse or short passage a week on your own, with your family or together as an entire church body. This Fighter Verses™ compilation of 260 passages will help believers fight the fight of faith. They provide the encouragement we need daily, focusing our thoughts in three main directions: fixing our hearts on the character and worth of our great God; battling the desires of our flesh; and rejoicing in the work of Christ in the Gospel. 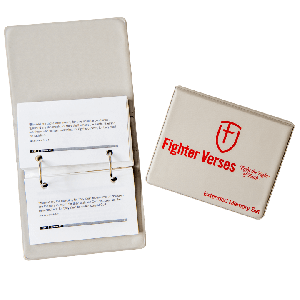 This two-ring binder contains five sets of Fighter Verses (52 passages each). Each 3" x 5" card is double-sided. See a list of verses at FighterVerses.com. 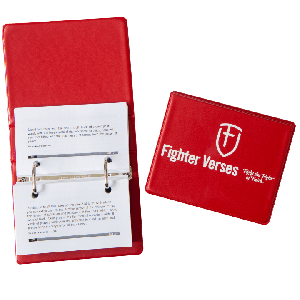 Order 10 or more Fighter Verses Packs to receive a discount. This two-ring binder contains five years worth of extended memory passages. Each 3" x 5" card is double-sided. Order 10 or more Extended packs to receive a discount. 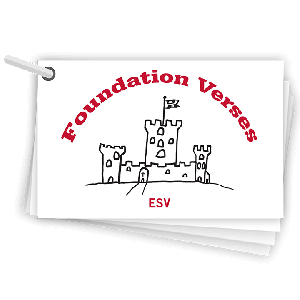 Foundation Verses are strategically chosen Bible verses for children 2-5 years old. The pack includes 76 short passages with image prompts to help non-readers remember the passage. The vision of this set is to lay a firm foundation of basic biblical truth that will pave the way for faith response and establish the habit of hiding God’s Word in the heart. Printed on sturdy 2.25" by 3" cards and bound with a metal ring. The front of each card features an image and the back has the corresponding verse. Order 10 or more Foundation Verse packs to receive a discount. Looking for the NIV? Contact us. Please Note: Temporarily out of stock. Memory incentives and rewards provide valuable encouragement for young children as they memorize God's Word. Whether working with children at home or in a church memory program, these age-appropriate resources can help motivate children to work toward their memory goals and persevere in Scripture memorization and review. Read the article Give Tangible Incentives on FighterVerses.com for more suggestions on using memorization incentives. 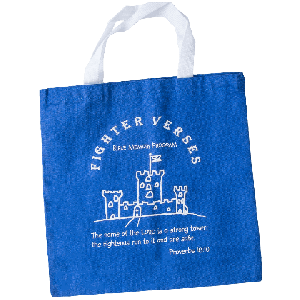 Children can earn this handy tote bag by memorizing Foundation or Fighter Verses. The bags are the perfect size for a child to carry their Bible, Foundation Verses and The Fighter Verses Coloring Book with them to church. Suggested Use: Encourage children 2-5 years old to memorize 5 verses to earn a tote bag. 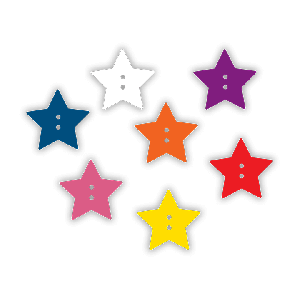 Then, continue to encourage them to memorize verses by letting them earn a star (which can be sewn or glued on the bag) for each additional verse. Children can earn stars by memorizing verses. The stars can be stitched (or glued) to the Fighter Verses Tote Bag. Please Note: Limited quantities at this time. The life of faith is a fight of faith, and believers must be armed for it. Because this fight is not against flesh and blood, but against spiritual principles, the Word of God is our indispensable sword. Through memorizing and meditating on the Word, you can have this powerful sword readily available to use at any time, providing you with ever-present counsel, encouragement and protection from the enemy of our souls. Check out FighterVerses.com for more information on additional resources and blog posts and download the Fighter Verses App to tools to help you memorize and review verses. Bible memory has never been easier with the Fighter Verses App. It provides a system to help you memorize and review verses at your own pace. With these tools, even people who have previously been unsuccessful at memorizing Bible verses can be successful. Download from iTunes for iPhone, iPad, and iPod, as well as from Google Play and Amazon for Android phones and tablets.